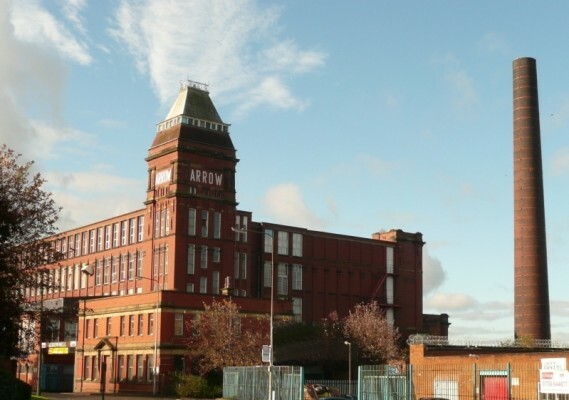 Built during the Edwardian era by R & T Howarth, Arrow Mill was one of the many mills designed by the Oldham family Stott and Son. Sydney Stott, the architect of Arrow Mill, favoured the distinctive and flamboyant architecture at the time and like his contemporaries gave considerable attention to the water tower, which was used to advertise the name of the mill, although interestingly enough he steered away from the Byzantine style water tower favoured by his brothers and adopted the Hotel de Ville characteristic instead. This Grade II listed building is situated on the south side of the Rochdale Canal. During the Industrial Revolution mills were located on canals not only for the ease of transporting raw materials and finished goods, but also to profit from the source of water by drawing it to work the mill steam engines. Due to the boom of the Industrial Revolution, Rochdale rose to prominence in the nineteenth century as a major mill town and centre for textile manufacture. 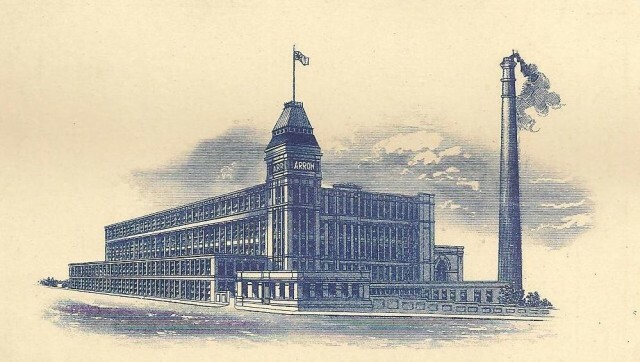 The industry continued to expand rapidly and at the beginning of the twentieth century a spate of new and larger mills were built and run by limited companies – Arrow Mill amongst them. Originally containing five acres of floor space, Arrow Mill was a fine example of the speed of mill building at the time. The contract to build was signed in late 1906, the first brick was laid in January 1907, the engine first ran under steam in February 1908 and the first cotton was spun in this large mill fifteen months after the first brick was laid. The year 1908 opened with the cotton trade as prosperous as ever and there were indications that the boom should last a considerable while yet. In the last week of March trade slumped suddenly and by the first week in April the cotton trade was stagnant. This industrial blow must have caused some considerable discomfort for Mr W H Waller the then Chairman of Arrow Mill Limited, in particular at the ceremony of Naming the Steam Engines which took place at Arrow Mill on Saturday 4th April of that year (the engines being named Reliance by none other than his wife) at a time when the future of the cotton trade was so uncertain. The J and W McNaught vertical triple expansion steam engine was one of only two made and was designed to develop 1,700 horse power at 75 revolutions per minute. The flywheel measuring 22 feet in diameter weighed 47 tons and was driven by 40 ropes and the barring engine with its horizontal cylinder driving through a vertical crankshaft was a typical McNaught feature. By the 1950s the engine was driving an alternator and many electrically driven frames were by then installed. The engine was scrapped in about 1960. The twentieth century saw the decline and eventual halt of the textile industry in the Rochdale area, but in that time Arrow Mill would diversify and flourish. 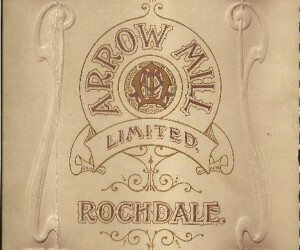 Arrow Mill was acquired by Courtaulds Limited in 1933 (it had sat idle for four years due to the Lancashire cotton depression) and Harold Ashton became its manager until he retired in 1961. Harold originally worked for Courtaulds in Flint where the then new fibre Rayon was produced for him to experiment with different staple lengths and blends on a spinning and weaving machine. He was given the job of finding a mill complete with machinery to demonstrate the effectiveness of the new fibre and availability of different staple lengths to spin with cotton. 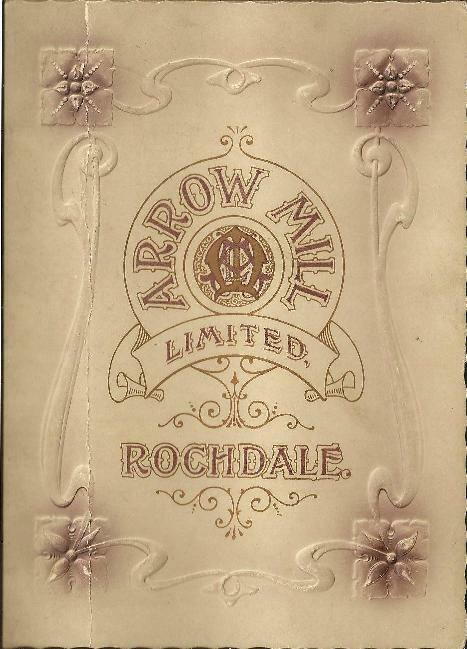 After viewing various mills in the Bolton, Bury and Rochdale area with the then director Mr H L Johnson, Arrow Mill was decided upon and then set up as a demonstration mill to show what could be done with Rayon. In about 1936 Harold Ashton went to the USA on the first of many visits when the American Viscose Corporation, which was owned by Courtaulds, started to produce Rayon to sell in the USA and after the Second World War Arrow Mill became the showcase for Rayon. When Tricel and other artificial fibres were developed these were then shown to the world on the original machinery which was set up to spin and work cotton. Courtaulds now clearly established, welcomed overseas buyers on visits to Arrow Mill on a regular basis. The 1950s in particular saw advertisements for the brand ‘Fibro’ the rayon staple fibre. Rayon was versatile in that it could be cut to different staple lengths so it could be worked with various natural fibres. It appears Courtaulds Limited sold Arrow Mill to Arrow Mill Fabrics Ltd in 1979. It was on the 25 September of that year that an official transfer of land was made between the two parties by which Arrow Mill Fabrics Ltd were transferred the right “to use all sewers, drains, watercourses, wires, cables and other services laid or passing through or under the land”. Arrow Mill was one of the last working cotton mills in Rochdale. The building was occupied during the 1990s by the cotton manufacturer Arrowvale Ltd and the company took advantage of the number of spacious floors to facilitate the cotton processing. The fourth floor was used for spinning (the raw cotton bales were hoisted up to this level), the third floor was used for carding and blending (the cleaning process), the second and first levels were used for beaming and winding and weaving took place on the ground floor. It was during the occupancy of Arrowvale Ltd that Arrow Mill became a Grade II listed building on 4 November 1996. Martin Yaffe International Limited moved into Arrow Mill in 1999, the building was purchased from Arrowvale Ltd in February of that year. Martin Yaffe imported and distributed licensed toys and houseware products (the latter up until September 2009), they ceased trading in July 2010. Simple Storage is the latest business to trade here at Arrow Mill and we are proud to be part of its history. This Grade II listed building now serves a different purpose to what it was originally constructed for. The strong Canadian cedar timber floors are now used for storing and warehousing third party goods and no longer support the machinery of yesteryear used for doffing, winding and weaving. The bygone age of cotton spinning for Arrow Mill might be confined to the annals of history, but its impressive size and layout still generate feelings of nostalgia.